Horace Goes Skiing is [drum roll please!!!] the first game I ever remember playing. 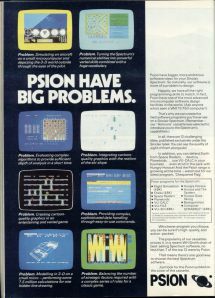 I must have been about four or five, so I reckon it was 1984 when I took my first sip from the honeyed cup that is computer gaming. Or should that be poisoned chalice? What would life have been like if my Dad had never bought that Spectrum? Would I have become interested in sport rather than video games? Would I have grown up to be a famous athlete? Anyway, looking back at Horace Goes Skiing now it’s amazing to think just how simple games used to be. 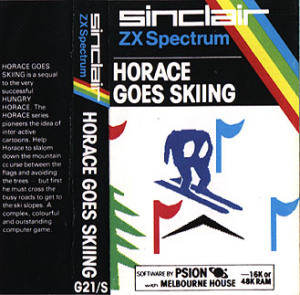 The game was basically in two parts: in the first part, Horace had to cross a busy road (a la Frogger) to get to the ski rental shop, and the second part featured Horace skiing down a mountain with his newly rented skis. And that’s it. When Horace gets to the bottom it all starts again, but this time with slightly more traffic and more gates to ski through. It’s this simplicity that is part of the game’s charm, but it’s also its undoing. By today’s standards, it’s a wafer-thin idea for a game, and playing it recently (there’s an excellent emulator (in Spanish) here: http://computeremuzone.com/ficha.php?id=710&l=en) I was surprised how enormously dull it becomes after a very short while. Back in the day though, my sister and I could play it for hours at a time – although, admittedly, most of those hours were spent waiting for the games to load. A lot of people look back fondly on the whole Spectrum loading thing, but even at the time I thought it was tediously rubbish. 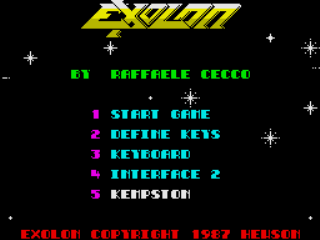 It generally amounted to staring at a screen of black and white fizz for around ten minutes, accompanied by a high-pitched sound somewhere along the lines of ‘WHEEEEEEEEEEEEEEEEEEEEEE GRGRGRGRGRGRGRGR WHEEEEEEEEE NNNNNNNNNNNNGGGGGGGGGG’, only for the game to crash as soon as you started playing. Some people tell me that they enjoyed the protracted loading times because it contributed to a heightened sense of anticipation. I say these people should get out more. The major flaw with Horace Goes Skiing, in my opinion, was that the Frogger-style game was incredibly difficult (at least for a five-year-old with under-developed motor skills), so my lasting memory of the game is one of seemingly unending frustration (as I tried to reach the skiing bit), followed by a brief seconds of elation (reaching the skiing bit), immediately followed by crushing disappointment (skiing into a tree and dying). Oh Horace, you cheeky little life metaphor!